Reprinted with permission from Muzzleloader magazine, January/February 2009. There has never been a time since its invention that the American muzzleloading rifle has not been produced; yet when regarded simply as a shooting apparatus, it fell out of favor soon after the close of the Civil War with the development of the metallic cartridge. However, during the last 50 or so years, thousands of individuals have again become very interested in them. They study them, read about them, collect them, shoot them, and… they build them. Uniquely American in its design, and impressively accurate in its day, this truly American firearm has long been dubbed the "Kentucky Rifle". After the tremendous American victory at the Battle of New Orleans, January 8, 1815, (the last battle of the War of 1812), a popular song was written by Samuel Woodworth to celebrate the feats of the men of Kentucky who had taken part under the command of Andrew "Old Hickory" Jackson. For 'tis not often here you see a hunter from Kentucky. Whate'er the game we join in chase, despising toil and danger. We'll show them that Kentucky boys are alligators-horses. And soon around the general flock'd the Hunters of Kentucky. For well he knew what aim we'd take with our "Kentucky Rifles"! It is generally agreed that this song is the basis for the name applied to the American Longrifle, still used today. It was named the Kentucky Rifle, because it was used by Kentuckians, not that it was made or developed in Kentucky. This American icon enjoys a prominent place in our nation's early history. With its long rifled barrel that fired patched round balls, it won laurels on several fields of battle: King's Mountain during the Revolutionary War, the War of 1812 at The Battle of New Orleans, and in 1836 when patriots with Kentucky rifles held out heroically for 13 days at the Alamo. It was far more than a tool of battle, as it helped to bring food to the tables and enabled frontiersmen to defend their homesteads. The revered Kentucky Longrifle - the defining symbol of self-reliance. During the 1960's there was a mounting interest in making the so-called "Kentucky Longrifle". This passion developed alongside an increasing interest in collecting and studying antique rifles and was fueled by the popular shooting matches of the National Muzzle Loading Rifle Association held spring and fall at their headquarters at Friendship, Indiana. The longrifle is one of the most important and finest art forms of early America. Thus, the longrifle is not just a weapon, a sporting arm, nor merely an important tool from America's frontier era, but also a representation of artists applying their expertise in design and execution. In 1980, Robert Weil wrote the first comprehensive and authoritative work on the new makers of the old traditional American arms. His book, "Contemporary Makers of Muzzle Loading Firearms", sparked the interest in many of today's builders and collectors and expanded the level of appreciation for this important and comprehensive form of art. As a contemporary art form, when designed with taste and executed with skill, it can exist solely as an object of beauty. If well done, it is indeed a complex sculpture of three-dimensional art with two-dimensional art superimposed. Its general structure is commonly made from beautiful wood, most often figured maple or walnut, and decorated or mounted in different combinations of forged iron, cast brass, and coin or sterling silver. No doubt, some of the finer longrifles being made today will be collected and preserved for their aesthetic aspects alone and never put to use for shooting .Yet I contend, that the flintlock rifle is full of life and to be fully appreciated needs to be handled, loaded, shot and cleaned, as well as being looked at, caressed, cherished, and studied. The thought and research required to build a "correct" early American rifle adds unique insight into the spirit of this tool, enhances the mindset of the maker, and bestows a deep appreciation of our glorious past that can be achieved in no other way. In 1997, the Contemporary Longrifle Association (CLA) was founded as an organization of artisans who study and continue to create the rifles and accoutrements of the American frontier period. Since its inception this organization has provided a wide stage from which artists and collectors have had the opportunity to exhibit, offer their work for sale, and acquire examples of frontier and longrifle culture inspired by the traditions of the eighteenth and early nineteenth centuries. In the forward of Following the Tradition the 2007 book by CLA founder, Gordon Barlow, written to celebrate the art and artisans of the Contemporary Longrifle Association, Giles Cromwell writes "…while preserving tradition is the bedrock and doctrine of the CLA, it would be erroneous to assume that this "following of tradition" implies only a duplication of the past; far from it. The varied artists apply their respective contemporary thought to their work allowing transcendence of and beyond historical boundaries. Fresh and innovative forms are born. Anything less would be unacceptable to the vision and discipline of these artisans." The Contemporary Longrifle Association is a non-profit organization of collaborative members, who are collectors, makers, and students dedicated to the art of contemporary longrifles, accoutrements and related items made after the mid-twentieth century. The Contemporary Longrifle Foundation (CLF) is the educational and fund-raising arm of the Association. Through the collective efforts of three renowned Kentucky gunmaking brothers, Hershel, Frank, and John House, a special handmade longrifle has been created for the CLF as a fundraiser. 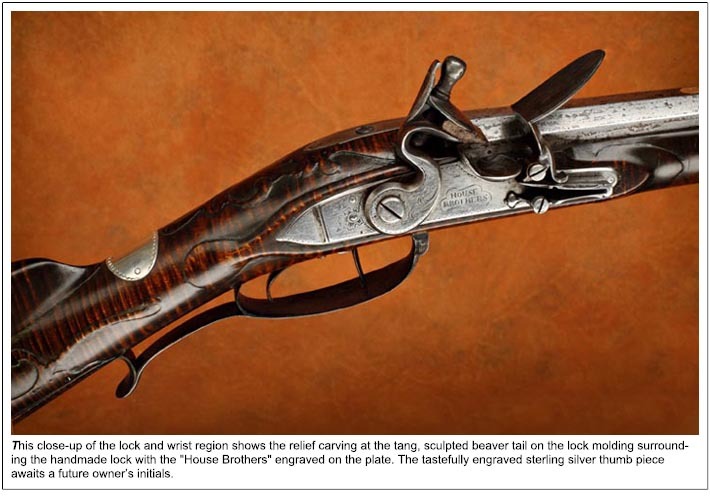 The proceeds from the "An American Tradition" House Brothers Handmade Flintlock Longrifle Project will enable the Foundation to continue its mission to promote the art of the Kentucky Longrifle and related arts through publications, museum exhibits, grants, and promotion of contemporary artists. Hershel, Frank, and John House are the progenitors of what has become known as the "Woodbury School" in today's contemporary longrifle culture. Named for the small Kentucky river town in which they grew up, products made by this group of individuals ingenuously express their personalities, artistic talents, and way of life. 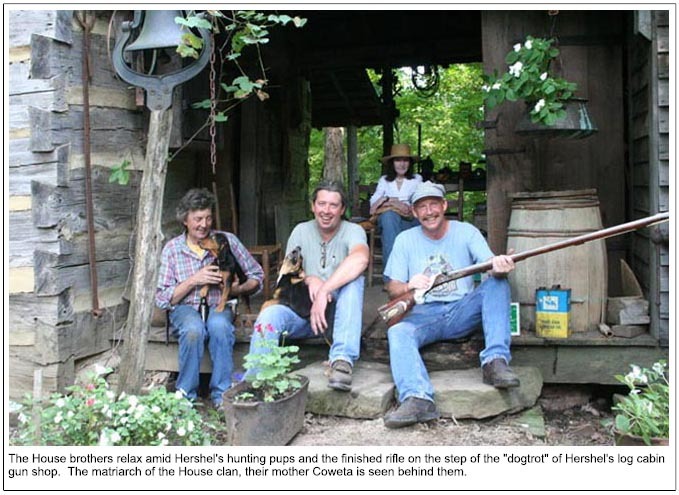 The first long rifles that Hershel remembers seeing were in an old store in Jamestown, Kentucky. He says it would have been about 1950. His family had temporarily moved and was living there while his father worked on Wolf Creek Dam that now holds back the Cumberland River and forms Lake Cumberland. After moving back to Butler County in 1956, Hershel found an ancient half-stocked percussion squirrel rifle in his neighbor, Mrs. Gibbs's old barn. A long time family friend, he asked her if he could have it. It had belonged to her father, but she let Hershel have it anyway. He promptly fixed it, got it firing, and received a tremendous amount of pleasure hunting squirrels with it while exploring the woods and paddling the Green river in a homemade canoe. In 1967, Hershel started building very intriguing, mostly iron mounted longrifles and has truly become a "living legend". 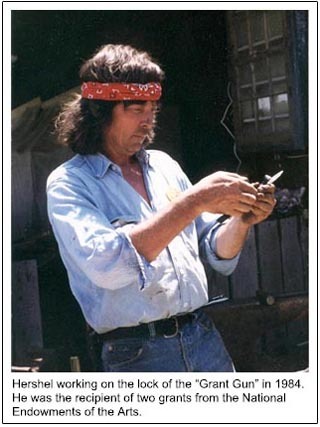 In 1979 he was featured in Foxfire V, one of the ongoing series of books recording the customs and lifestyles of people from Southern Appalachia. In 1984 and again in 1985, Hershel was awarded a National Endowments of the Arts ~ Folk Arts Apprenticeship Grant. 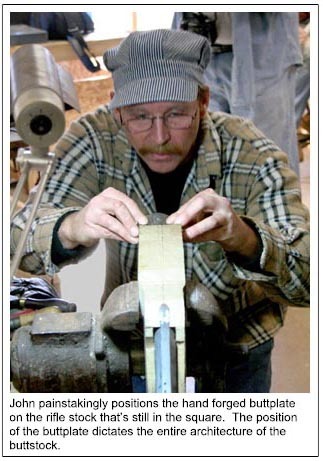 These grants provide funds for traditional craftsmen to pass on their unique trade through an apprenticeship program. 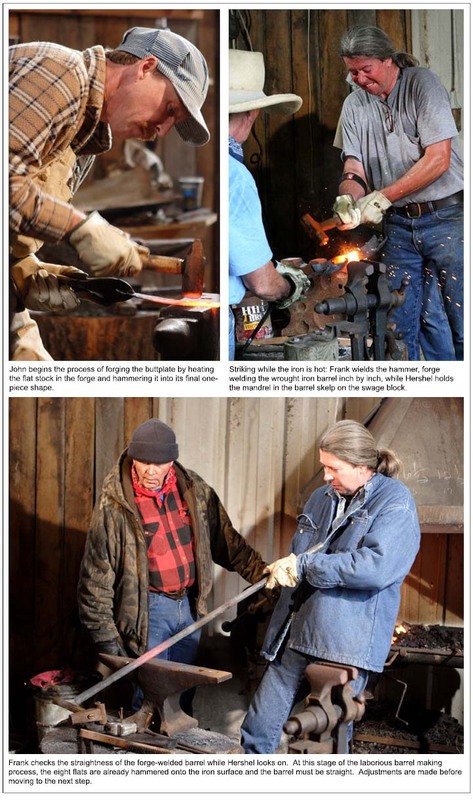 He has been featured in Field and Stream magazine, on Sports Afield TV, and is a much sought after instructor at gunmaking and blacksmithing workshops. Frank House, 18 years younger, grew up strongly influenced by his brother, yet his firearms soon took on a different appearance. He prefers entirely handmade locks, often casts his own brass mounts, and is respected for his fine engraving and intricate detail. Frank started working with Hershel part-time in 1979; building his own shop and becoming a full time gunsmith in 1988. He is well-known for his work in the movie industry by making a rifle for Mel Gibson in The Patriot and teaching him to shoot it. He also worked as head armorer in Master and Commander and was hired to make available his expertise on Pirates of the Caribbean - 2, 3, and 4. In 2001 he and his wife Lally moved from Woodbury to Paris, Kentucky and are restoring a historically significant 1790's Bourbon County log home. 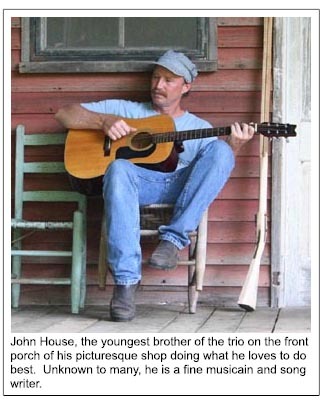 Brother John, the youngest of the trio, has made several rifles, but is best known for his expert blacksmith skills, his diverse knives, and discriminating iron trimmed sheath designs. He also has made items for the movie industry and is locally renowned for his jewelry, using indigenous semi-precious stones, and for his graceful, willow "rustic twig" style furniture. The artistry, personality, and genuine way-of-life of these three very individualistic family members has significantly influenced many aspects and countless members of today's contemporary longrifle culture; which brings up the concept of this term. Only recently has the term "Longrifle Culture" been properly addressed and was discussed at length by Richard Nicholas in his November 2008 article in "The Broadside", the quarterly newsletter of the CLA. 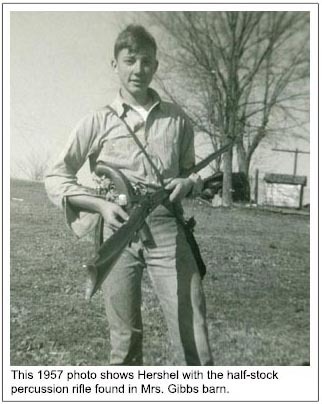 He writes, "The term "Long Rifle Culture" is a means to easily describe the underlying behavior and interaction between, collectors, shooters, builders, students, organizations; in short, any entity whose actions, interest, or way of life, is influenced by some aspect of the American Long Rifle." He goes on to say, "Our Long Rifle Culture is a dynamic population that often lacks constant boundaries, is constantly in flux, and is identified by entities that interact and more often than not, in some method compete with one another. Culture has been called "the way of life for an entire society", thus our Long Rifle Culture is actually a subculture within a larger society, perhaps most often observed as an interaction between the members of organizations that primarily collect antique long rifles and/or along with those interested in all facets of associated contemporary work. This is apparent in the many recent educational exhibits of firearms and supporting accoutrements - both new and old - presented by the populace of the CLA, KRA, the Horner's Guild, the N.M.L.R.A. and other collecting or shooting communities. In essence, this study, art, collecting and modern use, encompasses elements and behavior resulting in a complex society that can be defined as the "Long Rifle Culture". The Contemporary Longrifle Foundation is offering a once-in-a-lifetime opportunity to own a one-of-a-kind completely handmade Kentucky Longrifle by Hershel, Frank, and John House. Those in attendance at the 2008 Annual Show in Lexington, Kentucky had the first chance to see the unveiling of this exceptional work of art donated as a fund raiser for the Contemporary Longrifle Foundation. This kicked off a year long raffle program which will culminate at our 2009 Annual Show with the drawing of the lucky ticket. Response was tremendous. David Wright, Chairman of the Foundation and the House Brothers An American Tradition Project says of the project, the rifle and the brothers, "Masterpieces in art attain reverence when properly presented to the public. And, such is the case with the handmade longrifle created by Hershel, Frank and John House. 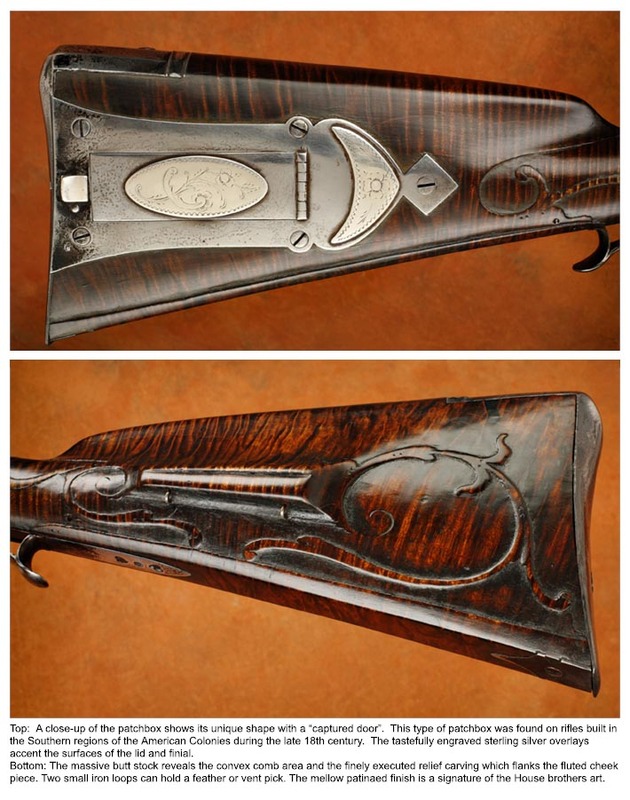 This masterful work epitomizes the gun makers' art in its display of craftsmanship and artistry. One of our important missions in the Contemporary Longrifle Association is to promote the art of the contemporary Kentucky Longrifle, its related arts and its artists. We speak of "Following the Tradition" thematically and earnestly. The House Brothers are artists and friends, contributing in the finest tradition of the CLA." 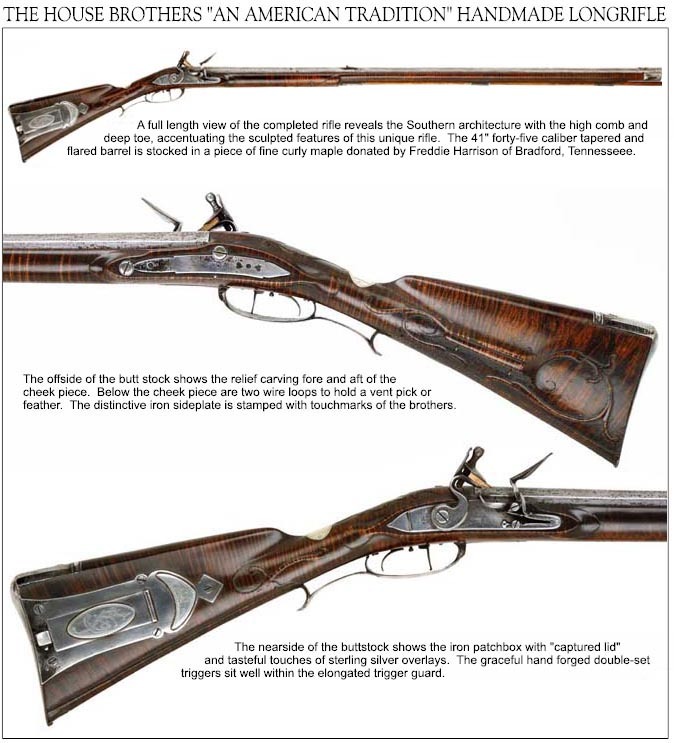 The flintlock longrifle is a beauty - the wrought iron barrel, the lock, double set triggers, iron mounted hardware, and even the screws are made by hand in the same tradition as those firearms produced by American gunmakers in the 18th century. The rifle is built in their nationally recognized style, known as the "Woodbury School", and named for the small Kentucky town in which the brothers grew up. The House Brothers have included many of their personal and unique attributes for which they are so well known. The rifle is relief carved and is mounted with engraved iron mounts. The patchbox is tastefully engraved with touches of sterling silver overlays and a sterling silver escutcheon (for a future owner's initials) accents the top of the graceful wrist area. The 41" tapered and flared barrel is rifled in .45 caliber. The only thing not made by Hershel, Frank, and John is the fine piece of curly maple wood in which the rifle is stocked. This piece of hand selected wood was donated by Freddie Harrison of Bradford, Tennessee. A supplier of stock blanks to muzzle loading gun makers for more than 30 years, Freddie volunteered one of his very best "pet" pieces of wood for this unique and important project. Frank says, "It's magic from the hammer!" that allows these intriguing icons from our nation's past to still be produced today. It's as if someone else is guiding his hand as he lays out the carving or forges the barrel and fashions the other integral parts for a magnificent flintlock or detailed set of triggers. He says that late 18th century gunmaker Thomas Simpson, said it all in his challenging advertisement in the July 26th, 1790 issue of the "Lexington [Ky.] Gazette" when he boasts, "From the wood of a tree and a bar of iron I can build a rifle with any man." This statement provides us with insight into the competitive nature of the gunmaking business in the late 18th century. There were many gunsmiths that had depended heavily on the military contracts of the Revolutionary war for their earnings and now found themselves on their own. In the years following the war, the commercial competition between the many craftsmen, created what is known as the "Golden Age" of the Kentucky rifle with each smith doing his best to out-do; to out-sell - the other with perfected art and style. This has left us with numerous outstanding examples of exciting artistic statements by these early American artists, inspiring contemporary artisans today. The year long building project has been documented through a grant from Hammond Communications Group, Lexington, Kentucky. DVDs of this video will be for sale in the future with the proceeds of sales going to the CLA. Photographers Ric Lambert, H. David Wright, and Steve Auvenshine have documented the building process through digital photography as well. Besides offering the completed rifle through a raffle in 2009, the Foundation desires to promote this art which represents the ultimate "Following the Tradition" of our forefathers - in view of the fact the Kentucky Rifle was one of the decisive factors in the freedoms gained by our American Revolution and the subsequent settling of our country. Given that the Foundation (the educational and fund raising arm of the Association) is a tax free non-profit entity, our mission is to promote education, fund grants, publish publications, mount museum exhibits, promote our artists, and other special projects such as this one. The funds raised from this endeavor will go to carry out that mission. An extensive PR campaign is planned throughout the year to encourage membership in the CLA, promote the House Brothers project, and to publicly feature numerous CLA artists. During the twelve year development of the organization, many artists have very unselfishly donated tens of thousands of dollars worth of their work that has been auctioned at our annual show each August; raising funds to further the endeavors of the organization, fueling the on-going movement, and promoting rapid quality improvement of these Contemporary art forms. The publications of the Longrifle Cultural Movement; Muzzleloader, Muzzle Blasts, On The Trail, and Smoke & Fire News, support our efforts and you will be seeing stories about the "An American Tradition" project and about many other CLA artists in these publications in the up-coming year. Additionally, a feature story about the project and the CLA is scheduled for release in 2009 in National Rifle Association's American Rifleman magazine. Chad Adams, field editor for American Rifleman Television is currently filming an episode featuring the House Brothers, the longrifle project, and the CLA. It will be aired in 2009. We would like to personally invite you to come on board! Please come join the Contemporary Longrifle Association and start making plans now to be present at the 2009 annual meeting, August 14 & 15, in Lexington, Kentucky. Come be part of this exciting project and the continuing history of the Kentucky Rifle. You may have already heard that the 2008 meeting and show of the CLA was truly electric. It was the first year of the addition of an "antique" exhibition and I have only heard great comments and can only say great things. Perhaps Don Getz said it best, "It was such a joy to see the great variety of items displayed there. It is hard to put into words the effect [the addition of antiques] this has on the show. While the CLA portion itself is great, and seems to be getting better, the addition of this old stuff really adds to the overall greatness of this show. From my point of view, I think this was the greatest collection of items ever put under one roof at one time." I could not agree more! The CLA has truly evolved into an eclectic art show of many associated items and ideas and this has opened the door for the full spectrum of antique arms, accoutrements, armament, and art as well. And we have just begun! In closing, raffle tickets for the fundraising "House Brothers - American Tradition" rifle are now on sale for $5.00 each or 5 tickets for $20.00. Anyone interested in becoming a member of the CLA and /or supporting this project by buying or helping sell tickets can visit our websites; www.housebrothersproject.com and www.longrifle.ws. Here you will find detailed information about the CLA and numerous photos regarding this phenomenal project, the brothers, and the effort in capturing the process. Hope to see you next August!